Plot: A department store clerk falls in love with a struggling inventor but she becomes sidetracked by life in high society. Manhandled is one of Swanson's best silent films. The script was based on a short story that appeared in the Saturday Evening Post. Gloria worked incognito in a department store for two days to get the feel of her character and it definitely helped. It is one of Swanson's best remembered silent roles and she received some of her strongest reviews. Manhandled has several memorable scenes. The first is a hilarious sequence in which Gloria leaves work for a hectic ride home on the subway. 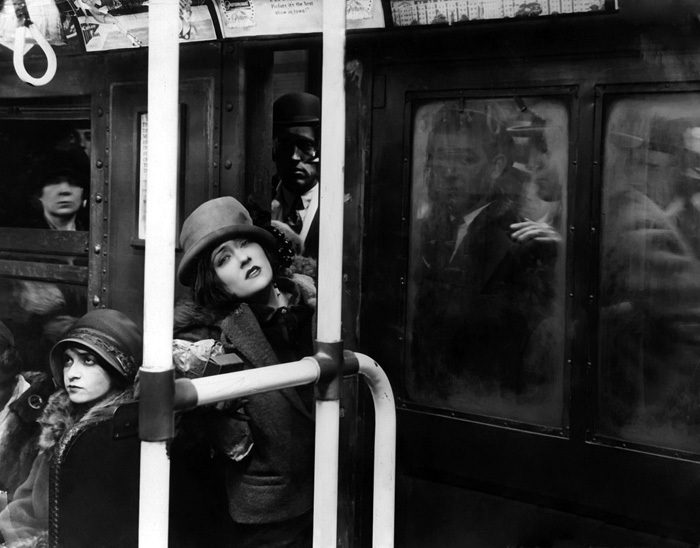 It is apparent that New York's subway system was as crowded then as it is today. Another scene has Gloria impersonating Charlie Chaplin at a party. She would reprise this impersonation again in Sunset Boulevard. After the success of Manhandled, it was obvious that Allan Dwan was one of Swanson's best directors. This would allow Gloria to stay in New York and work at the Astoria Studios instead of returning to Hollywood. The New York Times said: "Those who have found entertainment in Miss Swanson's previous vehichles will enjoy every moment of this picture and those who have not liked former efforts of this Oriental-eyed beauty will possibly be won over by the sotry and the acting. This is one of the few films that we have heard draw spontaneous applause from the audience, even before the last fade out."